Dental practices rely on a steady stream of patients to remain solvent and most dentists have marketing plans in place to acquire new patients. Private Practice Summit founder, Nitin Chhoda, specializes in assisting small practices. In his coaching program, he found that many dentists have a patient acquisition cost (PAC) that’s too high in today’s economy and offers sage advice to lower costs while maximizing income. Acquiring new patients can be a costly process and Chhoda’s techniques help ease the pain for dentists already suffering in a depressed economy. Chhoda says it’s imperative that practice owners not limit themselves to a single media and to test multiple methods at the same time. He suggests running the same ad in different media, such as newspapers, letters and websites. The method allows dentists to discover which avenue garners the most initial responses and provides the framework for testing an array of variables. The composition of the local population within a dentist’s service area will play a large role in the type of advertising that’s most effective, depending upon the target audience. Older patients are less likely to use the Internet or social media and respond more favorably to print ads, letters or postcards. 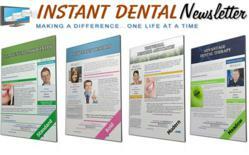 Chhoda recommends an automated system such as dental newsletter, a cost effective means that allows for customization. Younger clients are more likely to view social media, websites and act upon online offers. Free and reduced price offers are sure to pique the interest of both established patients and established clients. Depending on the offer, the PAC can be quite low. Chhoda noted that dentists have an extensive array of available options, from free consultations and eBooks to reduced rates for new patients or those who pay in a particular way. Acquiring new patients can be a costly process and Chhoda’s techniques help ease the pain for dentists already suffering in a depressed economy. Different methods will work more or less effectively, depending on the location, target audience, media and offer. Chhoda’s tips provide different dentist marketing with multiple means of determining the lowest patient acquisition cost, while allowing them to maximize their return on investment.